The spatial mode structure of a diode laser is determined by the ridge width of the waveguide, similarly as the core of a fiber-optic cable. For single-mode laser diodes, the ridge width is determined by the wavelength of the laser but is typically between 3 to 10 microns wide. Such a narrow waveguide allows for single transverse electric (TE) and transverse magnetic (TM) modes to be supported resulting in a perfect TEM­00 beam profile. The limited volume associated with having such a narrow active area results in far less power generation and much larger power densities at the facet, but it also results in a much lower capacitance allowing for quicker switching, therefore, making single-mode laser diodes far superior for high-speed applications. Single-mode laser diodes are available in both free space and fiber coupled packaging configurations. Here at RPMC Lasers, we offer a wide range of wavelengths from 375nm-2128nm with single-mode outputs, including DFB, DBR, and VBG stabilized single frequency diodes. 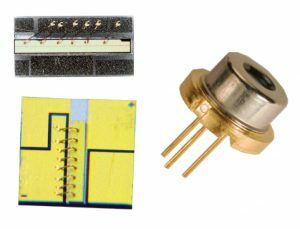 These single-mode diode lasers are the ideal for a diverse range of applications including fiber laser seeding, confocal fluorescence microscopy, gas sensing, and telecommunications. The search filters to the left can allow you to better sort through the full range of single-mode laser diodes offered at RPMC to find the one which is best suited for your application, or you can talk to one of our laser experts today by calling 1-636-272-7227.